Today is the first chance I’ve had to breathe since the evening of the 22nd. There has not been a moment that hasn’t been filled with cooking, cleaning, visiting, cooking, cleaning again, wrapping, unwrapping, cooking some some and cleaning up. My forays into the garden were only for useful purposes; dumping onion peels, potato peels, celery stumps, egg shells, broccoli peels and such into the hole by the rainbarrel. I didn’t get much of a chance to wander, to observe or even to think. I have no idea what the squirrels have been up to. Yesterday, Danny and I made ornaments for the birds. I had cut out strips of cardboard, about 3″ x 8.5″ and then threaded nylon string through a punched hole. So Dan and I spread them with chunky peanut butter (in retrospect, creamy would have been a better, smoother choice) and then covered the peanut butter with bird seed. Rich sat across the table and gave me a lecture about enabling birds and disturbing migration patterns. I began to explain that there are many birds that don’t migrate and we’ve disturbed their natural environment when I caught a glint in his eye – ah… trying to bait me? Not this Christmas, little brother. I took a big cleansing breath and sprinkled bird seed. Dan was too involved with hockey, ping pong and some sort of nerf target game to hang these ornaments outside, so I took a minute after sunset to throw on my boots and drape them on the lilac bush, the groovy bench and the shepard’s hook. We expected heavy snow but didn’t get it. There was a bit, hiding where I scooped a handful of snow to throw at Julie last night as they left. I’m not really sure who started it but suddenly as they headed out the front door, the air was filled with thrown missiles, bursts of snow, floating crystals and lots and lots of shouting. I believe it was Julie. This morning, the bird feeder ornaments are still untouched, but they are very greasy. There is a new layer of snow, but much less than was expected. The pond is filling and soon, we will not be able to tell where it actually is – there will be no dip in the yard. There are drifts and drifts everywhere and it’s not a simple task to slough around the yard. I am getting a workout. There are Damn Rabbit tracks everywhere again. One set of tracks makes me laugh. They run right up to a tree and then suddenly stop. I picture a Damn Rabbit bumping his face into the bark, like a Bugs Bunny moment, but I think these are squirrel tracks and the little guy jumped up into the tree. The chive heads swing in the breeze, like heavy, doleful church bells. 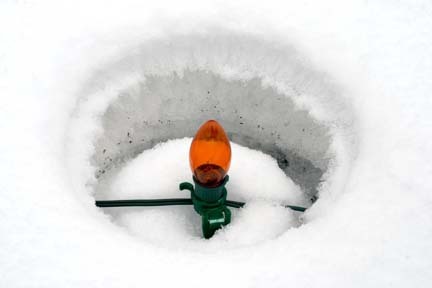 The Christmas lights in the ground have created a row of deep, perfectly round holes as they warm the snow around them. These holes are like the sides of a canyon, showing me all the layers of snow that have fallen. Gwen’s new shrubs are nearly buried, but her expectations are being fulfilled. The red branches stand out clearly and brightly against the snow. The compost has accomplished a big bunch of nothing in the weeks since I’ve checked it. Now I’m thinking I need to throw a few shovels of snow in there, to moisten it and jumpstart some decomposition. I look along the hydrangea bed in the back and see canine tracks again. Hmm. The dogs have not ventured beyond a very limited range and I don’t see any of their tracks actually leading to this grouping. Then I see them along the fence, in a meandering trail. My heart beats a little faster. Yes, there is a coyote visiting here and indeed walking along that bed. Winter is just so cool. When else can you see what really goes on in your garden? The thistle seed feeder has been neglected lately, so I empty the few inches of seed that is left. Finches seem to be picky eaters. I fill the sock with new fresh seed and rehang it. The birds should find all these treats in the next few days.